There are different methods for strapping. One of these is strapping with steel strap. When pallets are transported, it is important that they are stabilised. If the pallets are not stable, there is a possibility for damage. Pallet loads can be secured in different ways. Strapping belongs to one of the possibilities. Strapping with steel strapping is suitable for heavy products or products with a sharp edge. 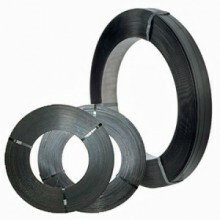 Below you will find an overview of the types of steel strapping that Cyklop offers.